From its eclectic soundtrack to its jawdropping moments of shocking violence (especially if you have a fear of anything involving ears and a razor blade), Quentin Tarantino’s Reservoir Dogs was an iconic film that (effectively) changed the landscape for independent film as we know it today. 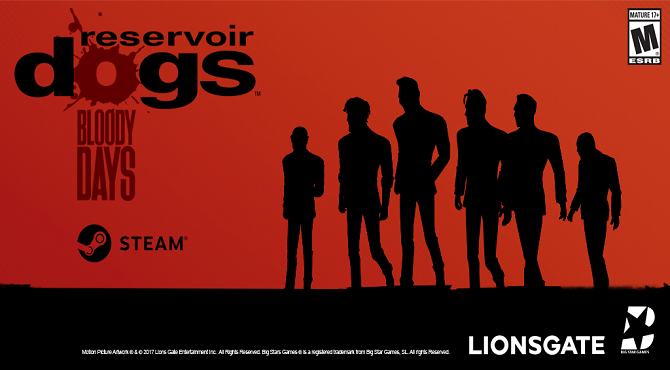 Banking its name on the classic film, Big Star Games’ Reservoir Dogs: Bloody Days marks an attempt at celebrating the film’s 25th anniversary by bringing the film to interactive form. Given that the last attempt at translating Tarantino’s masterful crime film was a bit of a disaster in the 2006 PS2-era title — one that was more or less a Grand Theft Auto knock-off — Reservoir Dogs: Bloody Days makes a bit more of an earnest attempt at creating a gameplay experience worthy of style and swagger that defined the original film. While some of its ideas are executed well, Bloody Days has a hard time overcoming its constraints as a mediocre shooter that happens to be utilizing an iconic license. While some of its ideas are executed well, Bloody Days has a hard time overcoming its constraints as a mediocre shooter that happens to be utilizing an iconic license. 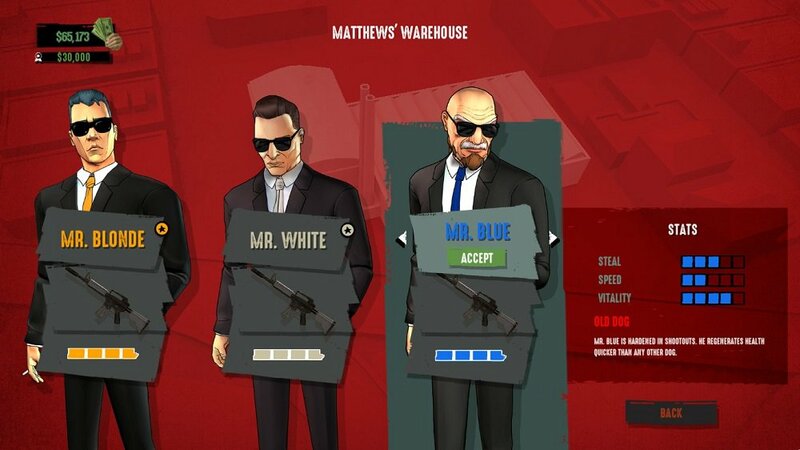 Reservoir Dogs: Bloody Days is a top-down shooter that puts players into the roles of each crew member from the film as they execute a series of heists, with the roster including Mr. White, Mr. Pink, Mr. Blonde, Mr. Brown, Mr. Orange, and Mr. Blue. 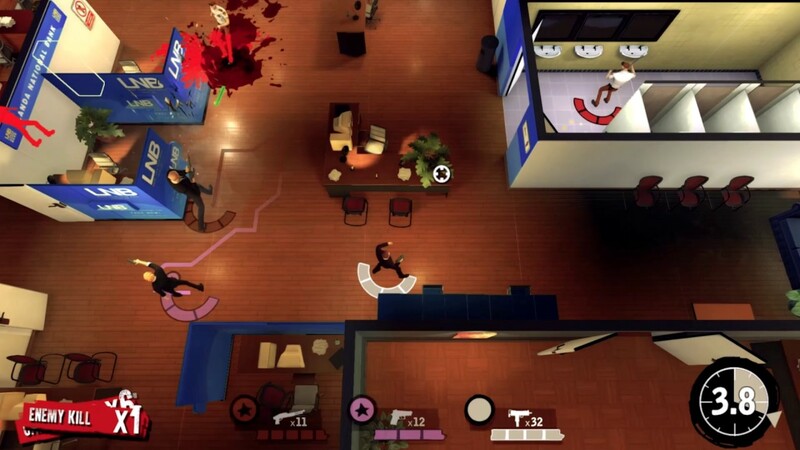 Utilizing anywhere from two to six of these characters, players navigate the characters through a labyrinthine series of corridors and halls to complete the heists as efficiently as possible, while taking advantage of each characters’ particular abilities and skillsets. 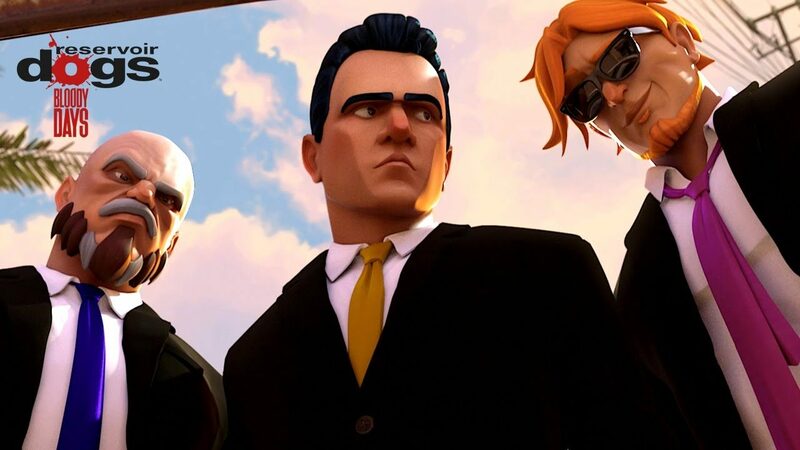 Where the previous game iteration of Reservoir Dogs took the shape of a mediocre action title trying to compare itself to Grand Theft Auto, Bloody Days‘ top-down shooting brings a more immediately accessible level of gameplay that seems a better fit for the license it draws from. Controlling one character at a time, Bloody Days plays almost as much as a puzzle game as it does an action-heavy shooter — fans of Hotline Miami especially will find something to enjoy here, though at a slightly less hectic pace than that series offered. Controlling one character at a time, Bloody Days plays almost as much as a puzzle game as it does an action-heavy shooter. On paper, the idea of a more strategically-minded action game based on Reservoir Dogs seems like a match made in heaven; the easy pitch would be that Bloody Days often feels like a top-down version of the Payday titles. The reality though is that Bloody Days only succeeds on this front in spades. The gameplay itself — though competent and enjoyable at times — quickly becomes repetitive in longer spurts and doesn’t offer too much variety over the course of its surprisingly (if maybe overdrawn) lengthy campaign. Kill guards, find the objective, hold out, get back to the escape car as fast as possible — wash, rinse, and repeat. 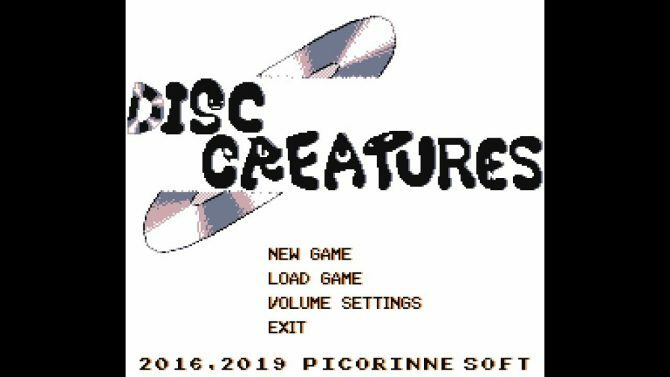 This can especially become grating after some time with its unskippable cutscenes that players will encounter during their run and, most of all, some annoyances with the controls that will certainly lead to a sense of “trial by death” progression. Given that the title is PC-centric, keyboard-and-mouse controls seem to be the way to go over using a controller or gamepad, though even then players will still encounter some oddities with either setup. The controller options suffer from some poor button mapping — as shooting and sprinting are aligned with the bumpers on an Xbox gamepad — while the standard keyboard and mouse is more accurate, but has a slight latency between pressing a keystroke and the action happening on-screen that makes its fairly precise gameplay a bit uneven due to unwieldy controls. The gameplay itself – though competent and enjoyable at times – quickly becomes repetitive in longer spurts and doesn’t offer too much variety. Despite some of the gameplay setbacks from its uneven controls, Bloody Days does have one feature that is surprisingly novel and (perhaps) the game’s one saving grace, its “Rewind” mechanic. Essentially, players take control of one member of the crew at a time, and can then “Rewind” their actions that another member of the crew (and the player) can use to their advantage. 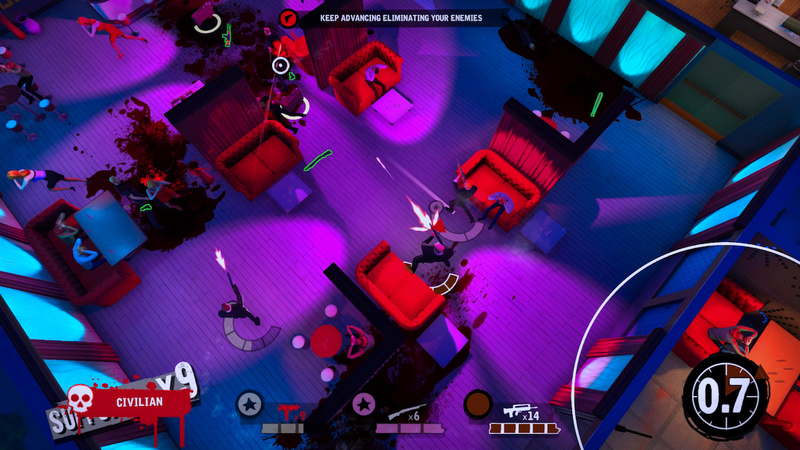 If the player goes in as Mr. Blue and ends up getting killed, a quick Rewind with Mr. White can have the player retry and intervene in the moments before his death and offer the player another chance to pull off the heist. Likewise, players can manipulate the mechanic to more strategic ends, like using one character to dispatch or distract a pair of guards, while another member of the team can sneak into the objective with ease. While most of Reservoir Dogs: Bloody Days‘ mechanics feel borderline “okay,” the Rewind mechanic actually offers some intriguing strategy for players to utilize, and a (somewhat) nuanced nod to the original film’s nonlinear plot and structure. With often huge swarms of enemies standing in the way between you and the objective, the Rewind mechanic offers just a touch of originality and a deeper level of gameplay than just mindlessly shooting baddies – which works sometimes – and hoping for the best. Bloody Days does have one feature that is surprisingly novel and (perhaps) the game’s one saving grace, its “Rewind” mechanic. 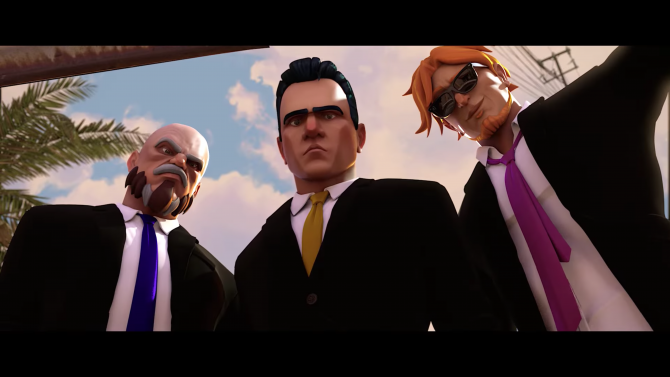 However, for as much as Reservoir Dogs: Bloody Days offers an interesting gameplay mechanic that could have lead to numerous possibilities for the player, ultimately it comes up short on offering a compelling gaming experience worthy of its namesake. 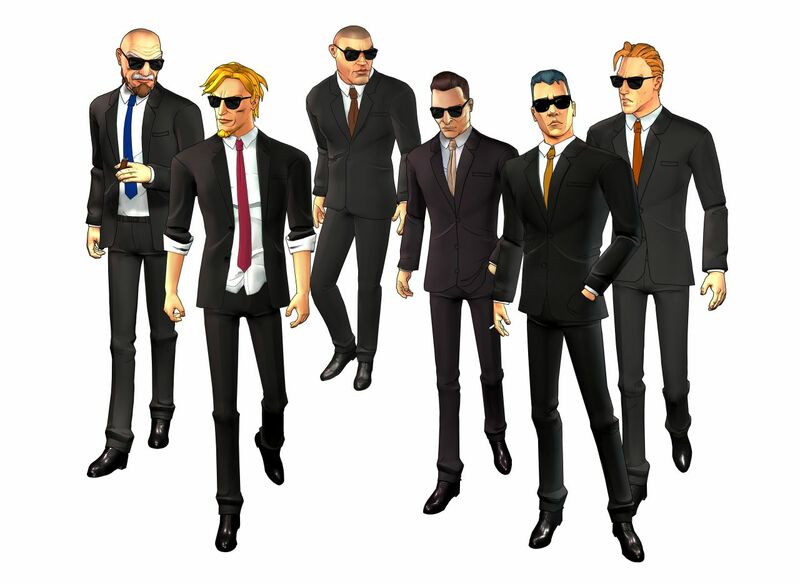 With character models that vary wildly from the film counterparts (with the exception of Mr. Blonde having a fairly close resemblance to Michael Madsen) and a gameplay loop that largely repeats itself throughout its run, Reservoir Dogs: Bloody Days tries incredibly hard to incite a response from those that love the landmark film and derive (some) sense of nostalgia from it. Even though Bloody Days tries to walk the walk and talk the talk, ultimately it feels less like a creative homage to a cult film classic and more like a shallow imitation with a hint of Tarantino flair. 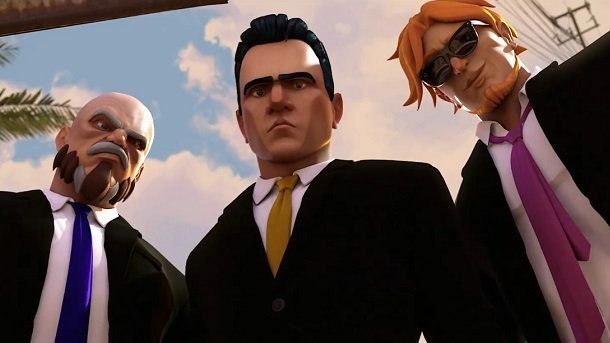 The upcoming Reservoir Dogs: Bloody Days is bringing strategic, top-down action to PCs later this month in a brand new gameplay trailer.